Learning art as a metaphor for living well. Miranda Altice at The Indigo Teacher has been working her way through our Waldorf art training program, Waldorf Art for Beginners over the past few weeks. She has written about her process of shedding & peeling away the layers of anxiety and fear that so many of us carry when it comes to Art. We're sharing some of her revelations here, and you will find a link to her full piece below. Taking the Waldorf Art for Beginner’s course from Waldorfish was honestly a summer treat for myself and would, in turn, help me in my quest to teach tiny humans how to enjoy expressing themselves through art. But it taught me more than that. Robyn and Brian’s super simple, self-paced classes reminded me how to feel confident in my artwork… and in my life… both of which could turn out any which way the blank paper and unpredictable watercolors decide. We've been having so much fun with this changing gallery of chalk-drawings we're curating on a 4' x 5' chalkboard in a local doctors office. 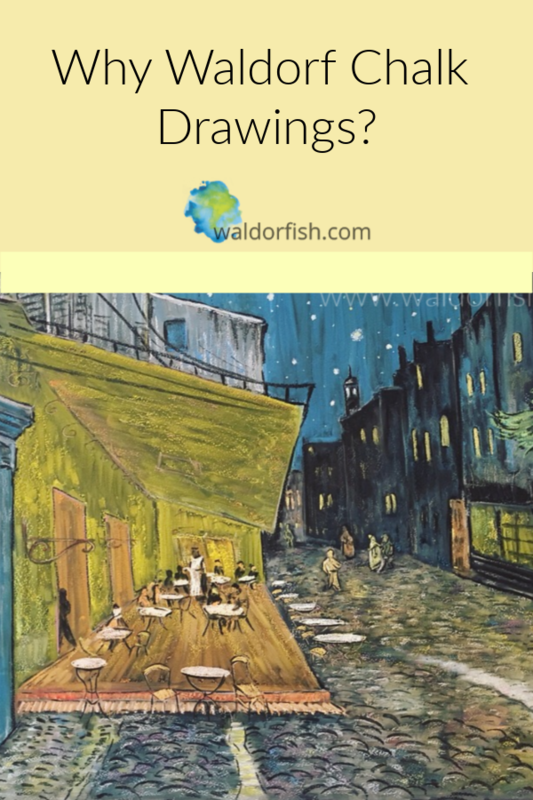 The piece below is #2 in the on-going series, and is clearly Van Gogh inspired! Brian condensed three hours of work into 1 minute in the time-lapse below. Enjoy! Brian and I are excited to be curating a changing gallery of chalkdrawings on this 4' x 5' board in a local chiropractors office! Dr. Lynn loves Gustav Klimt & abstract art - Brian decided to start the series with a piece loosely inspired by Klimt's Tree of Life. We will be changing the drawing out every 6-8 weeks and are thinking about working in the style of a different artist each time. Van Gogh inspired chalk art up next!